Hello Goodbye Dog introduces us to an affectionate, bouncy pooch named Moose who thinks saying “goodbye” to his girl Zara as she heads to school is as awful as “an itch that couldn’t be scratched.” Can Zara find a way to make Moose a welcome presence in the classroom? Yes! Maria Gianferrari is no stranger to Bildebok readers as I’ve featured three of her picture books, Penny and Jelly: The School Show, Penny and Jelly: Slumber Under the Stars, and Officer Katz and Houndini. Since we’ve met Maria, for Hello Goodbye Dog I thought we might learn more about her own beloved canine companion, Becca! Becca, Maria has just said “goodbye” but the door isn’t shut tight. If you follow her, where are you hoping she is headed? To Granite Lake in NH, so I can go for a long walk and a swim. Becca, you sniff something delicious and slip into the school cafeteria. What are three things can Maria say or do to make it easier to leave when it is time for “goodbye”? 1) Ask me if I want to go for a ride in the car—I love that! 2) Get out my leash, and take me for a walk. 3) Give me a Kong with a treat, that’s what she always does before she leaves, and I know she’ll come back. Library reading dog enjoying “The Four Puppies” with my kiddo and her favorite librarian, Fifi Abu,, circa 2007. 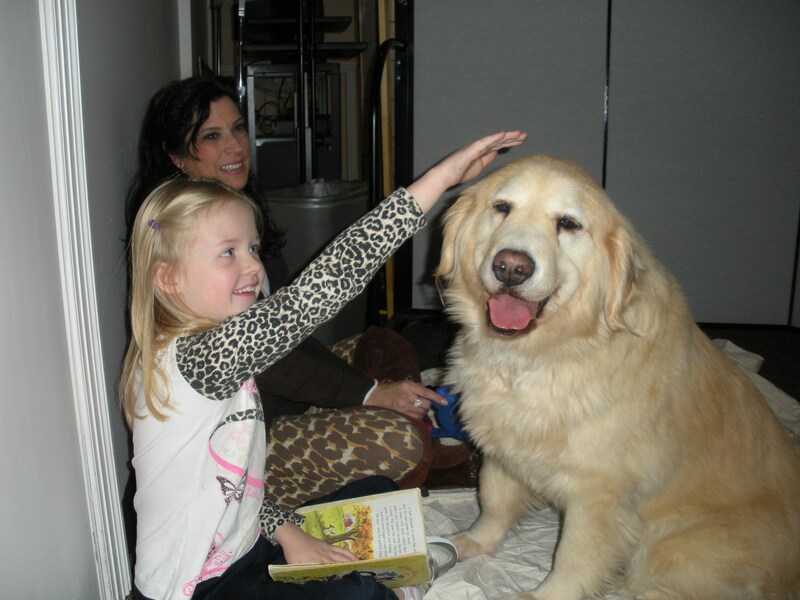 Becca, Maria is helping you with homework for therapy dog school. What books do you hope she chooses to read with you? For picture books: Gaston by Kelly DiPucchio (illustrations by Christian Robinson), Ragweed’s Farm Dog Handbook by Anne Vittur Kennedy and My Father the Dog by Elizabeth Bluemle (illustrations by Randy Cecil). Thank you Becca for your woof-ully wonderfully delightful answers! Readers (sorry – USA only, as it will be shipped by the publisher) who would like to win their very own copy of Hello Goodbye Dog can comment below. One lucky winner’s name will be drawn and they will be notified in the next 10-14 days. Congratulations Danielle Hanmelef – you are the lucky winner! Please forward your mailing address to me at cmealey (at) post.harvard.edu so we can send your book! Thursday, August 3rd: DEBtastic Reads! Maria Gianferrari is a picture book reading/writing, tea-drinking, dog-loving, birdwatching author of the Penny & Jelly books, Coyote Moon, an ALA Notable Book and a Junior Library Guild Selection and Officer Katz and Houndini. Her newest picture book, Hello Goodbye Dog, is illustrated by Patrice Barton. 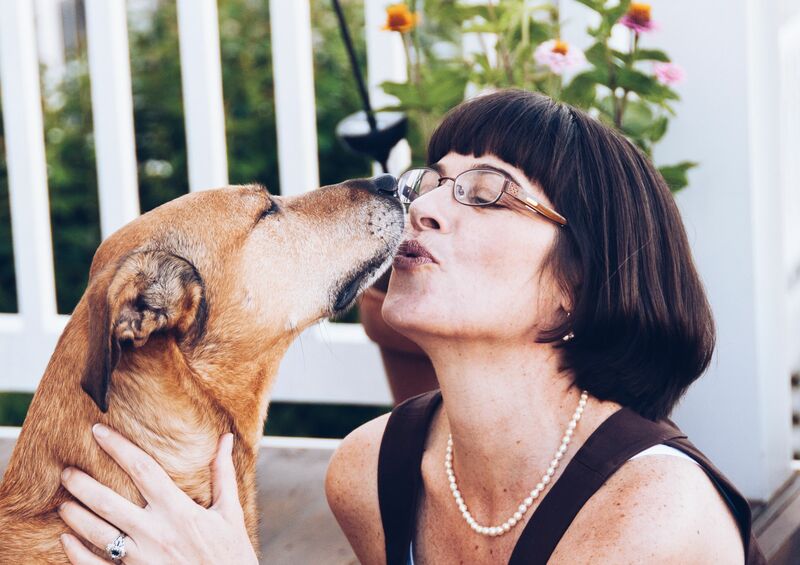 Maria lives in northern Virginia with her scientist husband, artist daughter, and rescue mutt, Becca. She has additional titles forthcoming from Roaring Brook Press, Boyds Mills Press, GP Putnam’s Sons and Little Bee. To learn more about Maria, visit her website: mariagianferrari.com, Facebook or Instagram. 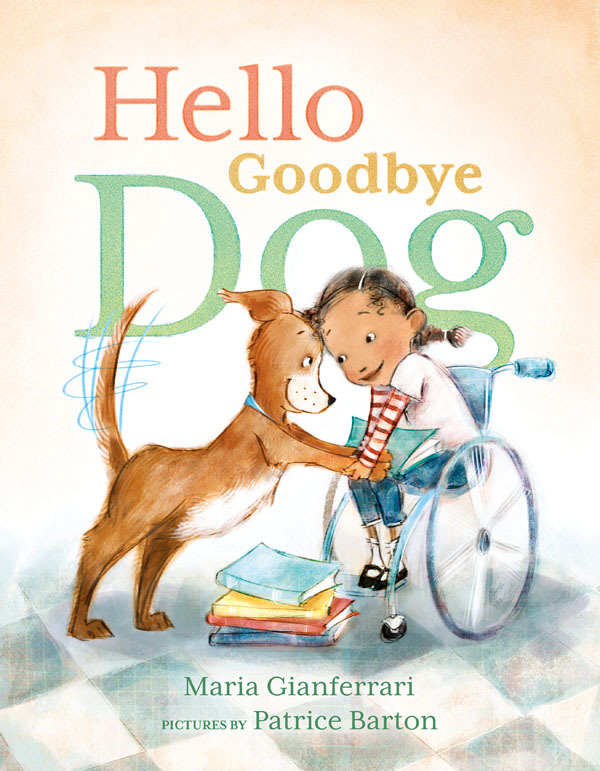 This entry was posted in Uncategorized and tagged Hello Goodbye Dog, Maria Gianferrari, Patrice Barton, picture book, Roaring Brook Press, therapy dog. Bookmark the permalink. 45 Responses to Hello Goodbye Dog and Giveaway! Great idea Teresa! We are lucky to be surrounded by many dog-friendly businesses and recreation areas. I often see Great Danes in my grocery store being trained as seizure dogs! I wish I could, Teresa!! I take her most places & she loves car rides, but it’s too hot most of the year here in VA for her to come places. Fun interview. The book looks really sweet. I will pass on the drawing. I am just buried in books right now. Thanks or the post. I agree, Cathy–too many books, way too little time! Woof, woof fellow dog lover! I agree – Patrice made a darling cover for Maria’s story. Hope you are settling into your digs or enjoying salty island breezes! I always tell her that she’s the best dog in the universe, Linda, but this is also true <3! And thanks for sharing too!!! Love the interview! My dogs can barely contain their excitement when they’re waiting for their boy to get out from school. I’m sure they would love to be at school with him all day, especially at lunch. I’m looking to reading Becca’s book. Congrats, Maria! Aw – that is so sweet! I love seeing dogs wait for their kid buddies to get off the school bus in the afternoons. Woof! Thanks for sharing. Ha!! I think many dogs would like lunch the best, Robin :). Thanks so much!! What a fab interview with Becca…my big pooches like to rumble in the snow, but I’m guessing you don’t get much accumulation in VA! Your book just arrived and it’s as terrific as all the buzz. Bosco and Rosy give it 4 paws up and woofed out that Moose and Zara should land on the bestseller list! Plus it’s a creative way to teach kids opposites. Four paws up – woo hoo! That’s another ringing endorsement for Moose and Zara. Thanks for visiting Nancy! What a fun interview! One of my favorite picture books is Ragweed’s Farmdog Handbook. I think the author and illustrator captured a dog’s personality perfectly. I think my dog Berry and Becca had lots in common. Thanks for the post today and I can’t wait to read this book. RAGWEED is so, so funny! I love that one too. So many dogs, and so many personalities. Thanks for visiting Danielle! I adore Ragweed too! Danielle–love it so much that you’re following the tour–thank you!!! What a lively interview, Becca, Cathy and Maria! 🙂 I’m looking forward to reading Hello Goodbye Dog–with my cuddly dog. Thank you! I hope that you and your cuddly canine will both enjoy the book! Woof! I hope you’ll like it, Teri :)! What kind of cuddler do you have?? This is a fun interview. I want to get my hands on a copy of this book. I’ve read mostly MG novels about rescue dogs and fewer PBs. So this one sounds delightful for young children. Nice to “see” you again here, Patricia!! Thanks for commenting & I hope you’ll like it :)! Great interview Cathy – I will surely share with my friend Alicia’s two little girls. 🙂 Thanks Chris – I bet they are just as smart and sweet as their mom is. Please say hello from me! Yes, very! Thanks for stopping by Kevan! Great post, Becca! 😉 Hugs from me and Captain! A very talented dog, Becca is! Have a great day Sheri!